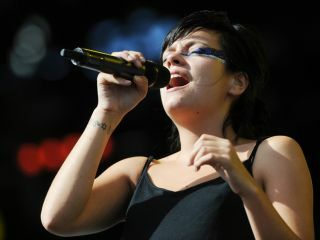 Lily Allen: bringing Kaoss to this year's festivals. First came Little Boots and her Tenori-on - now it transpires that Lily Allen has recently been taking to the stage with Korg's Kaossilator. It's not just any Kaossilator, either - it's the special, limited edition pink Kaossilator that made its debut late last year. In terms of features, this is identical to the standard model - so it's a simple, touch-based phrase synthesizer - but it's… well, pink. You can watch Lily playing the device at last weekend's V Festival in the video below (she picks it up at around the 3:20 mark). Amid all the other synths in the mix, it's not exactly clear what she's doing with it, but she's certainly doing something. Given this trend for pop stars making high-tech musical gadgetry part of their shticks, may we suggest that Pixie Lott gets her name on the list for Teenage Engineering's OP-1.